HOUSTON — (Oct. 19, 2017) — Scientists from Rice University and Texas A&M University-Corpus Christi's Harte Research Institute for Gulf of Mexico Studies have discovered that Earth's sea level did not rise steadily but rather in sharp, punctuated bursts when the planet's glaciers melted during the period of global warming at the close of the last ice age. The researchers found fossil evidence in drowned reefs offshore Texas that showed sea level rose in several bursts ranging in length from a few decades to one century. "What these fossil reefs show is that the last time Earth warmed like it is today, sea level did not rise steadily," said Rice marine geologist André Droxler, a study co-author. "Instead, sea level rose quite fast, paused, and then shot up again in another burst and so on. "This has profound implications for the future study of sea-level rise," he said. Because scientists did not previously have specific evidence of punctuated decade-scale sea-level rise, they had little choice but to present the risks of sea-level rise in a linear, per-year format, Droxler said. For example, the International Panel on Climate Change, the authoritative scientific source about the impacts of human-induced climate change, "had to simply take the projected rise for a century, divide by 100 and say, 'We expect sea level to rise this much per year,'" he said. "Our results offer evidence that sea level may not rise in an orderly, linear fashion," said Rice coastal geologist and study co-author Jeff Nittrouer. "We have observed sea level rise steadily in contemporary time," Nittrouer said. "However, our findings show that sea-level rise could be considerably faster than anything yet observed, and because of this situation, coastal communities need to be prepared for potential inundation." The study's evidence came from a 2012 cruise by the Schmidt Ocean Institute's research vessel Falkor. 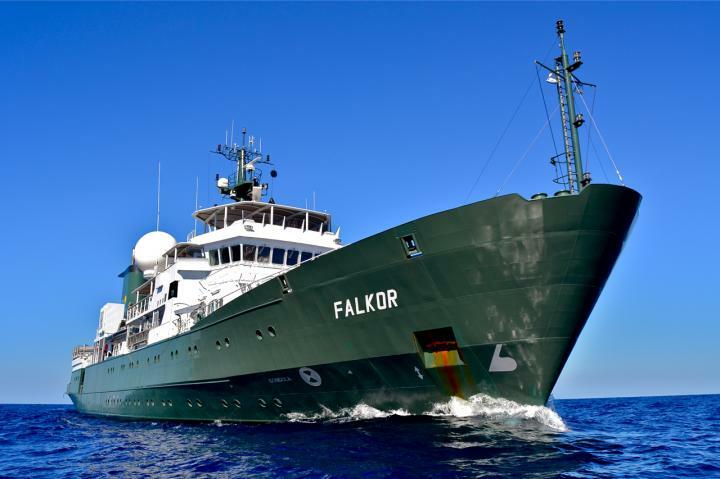 During the cruise, Droxler, study lead author and Rice graduate student Pankaj Khanna and Harte Research Institute colleagues John Tunnell Jr. and Thomas Shirley used the Falkor's multibeam echo sounder to map 10 fossil reef sites offshore Texas. The echo sounder is a state-of-the-art sonar that produces high-resolution 3-D images of the seafloor. "The coral reefs' evolution and demise have been preserved," Khanna said. "Their history is written in their morphology — the shapes and forms in which they grew. And the high-resolution 3-D imaging system on the R/V Falkor allowed us to observe those forms in extraordinary detail for the first time." All the sites in the study had reefs with terraces. Khanna said the stair-like terraces are typical of coral reef structures and are signatures of rising seas. For example, as a reef is growing at the ocean's surface, it can build up only so fast. If sea level rises too fast, it will drown the reef in place, but if the rate is slightly slower, the reef can adopt a strategy called backstepping. When a reef backsteps, the ocean-facing side of the reef breaks up incoming waves just enough to allow the reef to build up a vertical step. "In our case, each of these steps reveals how the reef adapted to a sudden, punctuated burst of sea-level rise," Khanna said. "The terraces behind each step are the parts of the reef that grew and filled in during the pauses between bursts." Some sites had as many as six terraces. The researchers said it's important to note that even though the sites in the study are as much as 75 miles apart, the depth of the terraces lined up at each site. Droxler and Nittrouer credited the find to Khanna's determination. Analysis of the data from the mapping mission took more than a year, and the time needed to respond to questions that arose during the publication's peer-review process was even longer. "That's the way science works," Droxler said. "This is the first evidence ever offered for sea-level rise on a time scale ranging from decades to one century, and our colleagues expected ironclad evidence to back that claim." "Scientists have talked about the possibility that continental ice could recede rapidly," he said. "The idea is that sudden changes could arise when threshold conditions are met — for example, a tipping point arises whereby a large amount of ice is released suddenly into global oceans. When melted, this adds water volume and raises global sea level." Khanna said it's likely that additional fossil evidence of punctuated sea-level rise will be found in the rock record at sites around the globe. "Based on what we've found, it is possible that sea-level rise over decadal time scales will be a key storyline in future climate predictions," he said.